Expansion Anchors are made from Carbon Steel, Stainless Steel, Free Cutting Brass, Leaded Brass, 301 Stainless Steel or Aluminium Which are passivated and tested to ASTM and other International Standards. They are available in any metric or imperial sizes as per Custom Specification. 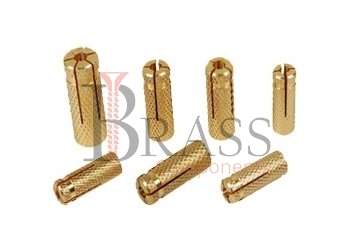 Corrosion Resistant Brass Expansion Anchors with inner threads. Brass Expansion Anchors are known as light to heavy duty anchors. Fully Threaded and Torque Controlled. Extension Sleeves can be added to create longer length. Higher Resistant to meet geometrically challenging requirements. Available with Increased undercut percentage in combination with optimized coating. RoHS Complaint, UL Listed and ETA approved. Designed to maximize safety, efficiency and ease of installation. Available in multiple head styles for multiple applications and finished appearance. Suitable for hammer-drilled or diamond-cored holes also. No Installation tool is required. Used when working with concrete, brick and block base material. Brass Expansion Anchors provide all safety relevant fastening in cracked and uncracked concrete. For used in masonry base which provides holding power through expansion. For Anchoring in concrete solid material components. We manufacture Expansion Anchors as per Custom Specification and export in Finland, Jersey, Spain, Switzerland, Ukraine, Austria and other European Countries. For more Information, Please Contact Us or Inquiry Now.